Recognizing that a course in economics may seem daunting to some students, we have tried to make the writing clear and engaging. Clarity comes in part from the intuitive presentation style, but we have also integrated a number of pedagogical features that we believe make learning economic concepts and principles easier and more fun. These features are very student-focused. The chapters themselves are written using a “modular” format. In particular, chapters generally consist of three main content sections that break down a particular topic into manageable parts. Each content section contains not only an exposition of the material at hand but also learning objectives, summaries, examples, and problems. Each chapter is introduced with a story to motivate the material and each chapter ends with a wrap-up and additional problems. Our goal is to encourage active learning by including many examples and many problems of different types. 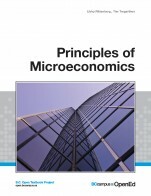 Principles of Microeconomics (Saylor) by Libby Rittenberg , Tim Tregarthen is licensed under a Creative Commons Attribution 4.0 International License, except where otherwise noted. The text covers all the areas and ideas of Macroeconomics that one would expect to find at the introductory level. The subjects are clear, easy to follow, relevant with applied examples. Global examples are used through the lens of US laws and economics. No index or glossary was provided with the version that was reviewed. Text is accurate, error-free, but does have a bias towards US law and economics. Many of the case studies are global in origin, which are excellent, however, the authors always return to the effects towards the US, or if a US case study is examined there is very little mention of the effect towards the Canadian economy. The content is up to date and should constantly be up dated to truly connect the student to the learning objectives as they effect the global economies of today. Generally the text will not become obsolete in a short period of time yet the authors will need to either update the data within the text or provide updated links to the already numerous web sites referred to within the text. The authors use a story telling format that is easy to read and comprehend. The text is consistent in terminology and framework. The early chapters are well setup providing foundational information for the each of the subsequent chapters. Each chapter progressively provides the learner with more challenging concepts, language, and equations. The text builds upon each chapter that provides effective information to the reader to continue. There are many reading sections with each followed by "Key Takeaway" statements and "Checking Your Understanding" questions. It may be difficult for those not familiar with economic concepts to not read the chapters sequentially. Story telling format; the reader is provided with fundamental economic realities in the world using examples that are relevant to people in general. The foundational concepts are discussed before the math and graphs are introduced hence the reader has already seen the "what's in it for me" reality. The text does not appear to be insensitive or offensive in any way. As the text is focused to US learners, students from other countries, such as Canada, may not feel that this is relevant to their history, or future. The text is well laid out as is the content but the text should be entitled: Macroeconomics: Theory in Application from a US Perspective. Web links worked as did page reference links (there was a request to register to Flatworldknowledge.com which I did not do). The international examples are excellent for any student to use. Overall the text would be excellent if there was a considerable amount of Canadian content added. The reason for this is that while economic policies appear to be similar between Canada and the USA, the decision making is different. Yes, it’s very comprehensive, which covers main topics in the introductory course of microeconomics. Starting from Chapter 14, it covers topics even outside microeconomics, which goes on to macroeconomics and many global issues as well. Yes，the contents represent standard introductory content for microeconomics, and use rigorous academic concepts even at such introductory level, so that the reader would find it very convenient to move on to more advanced treatment of microeconomics later on. The graphs are very standard and accurate too, except that the format of the graph is not so clear. Yes. As an introductory book, the text is pretty straightforward. I think that a foreign students with moderate knowledge of English could command reading it, it’s not very difficult to understand the words. For important concepts and technical keywords, the author even provides a section for keyword concept summary at the end of every chapter. Almost. As an intro book, the terminology is well defined in each chapter. However, there’s really not a good criteria for me to judge whether they’re all in a consistent framework, since microeconomics is a consistent framework in itself, unlike macroeconomics where there’re many schools and debates. In this text, there’re no obvious inconsistency between one explanation and another. Yes. The textbook covers actually different topics in microeconomics, many of which are actually topics for a whole advanced course of microeconomics in the later years. I would say that, before jumping into those advanced topics, this book should be a good review materials. Almost. The text itself is very clear, and it’s very easy to understand for someone new to microeconomics. However, there’s room for improvement in terms of being logical. For example, it’s not so clear how is economy of scale and international trade are related with each other. The author draws the graph of lower average cost first, but explains the issue by arguing that large economy has more demand, which leaves the reader unclear which factor is actually contributing to the large trade flow. The direction, links and graphs display is clear, and in some part, it’s beautiful also. In some part, the QR scan is provided so that the reader could conveniently be navigated to useful links. The only drawback with the graphs are that they apply vague in the display, and would be better adjusted. The English in the text is very good, and almost no gramma errors are found. Yes. As an intro microeconomics text, the book covers examples from all around the world. The mentioning of inequality problem using examples from developing countries are unusual in some sense. I think the book is itself a good one for a first course in economics. At the same time, I would suggest adding some difficulties to it by adding more exercises in it, for example, having more questions for the students to draw these supply and demand graph, and do more comparative statics would prepare them better for an intermediate level of microeconomics. Finally, some examples are a bit redundant, although it’s easy for readers to understand the theory with examples, the author could still reduce them to a moderate amount. This textbook is far too large and covers far too many topics for a principles of microeconomics text book. I would recommend removing chapters 13, 15, 16, 17, 19 and 20. Chapter 18 could be optional. Many sections are too long winded. For example, the discussion on the production possibilities frontier is amazingly long, yet still fails to cover some basic extensions of the model, such as what happens when some of the underlying assumptions are relaxed. Otherwise, the text covers most key subject matter. I would have liked to have seen more of a discussion on welfare economics, deadweight loss of taxation/subsidies, price regulations, and externalities (weak discussion on p335 could be elaborated). This textbook is lacking a table of contents, index and glossary making navigation exceedingly tedious. The content is accurate although there is a strong bias towards the United States, as with so many texts. However, in some cases, it comes across a little strong. For example, the discussion on US agricultural subsidies points out how farmers' surpluses are sent abroad as part of a food aid program. The discussion go on to further mention how agricultural subsidies depress world food prices and contribute to the inability of poor developing nations to escape from the poverty trap. There are some errors in formula (ex: p 236), but this is likely just a typo. The microeconomic theory portion of the book is well done. It shouldn't be too difficult to insert updated case studies when the book is revised. A separate section on market failures and welfare economics might be of value however, as these are areas of increasing importance. The final few chapters, those I recommend don't belong in this text in the first place, are more time sensitive due to their focus on policy rather than theory. These chapters are likely to become out dated the most frequently. The entire book is extremely wordy and long winded. Aside from the excessive coverage of material in the later chapters (that I recommend removing) even some of the simplest topics are discussed in far too much length. I have never before seen a principles text of 1128 pages. As a first year textbook, I suspect this will be extremely challenging for most students to get through. Given the apparent attention of young students appears to be diminishing, I suspect this writing style could turn off many. Most of the jargon is well defined, albeit repeatedly in some cases. At times, concepts seem to come out of nowhere. For example, Figure 6.10 demonstrates Supply is marginal cost and Demand is Marginal benefit. This an important concept that is not fully developed. The text doesn't appear to have any problems in terms in internal consistency. Each chapter is broken up into many sections and subsections. Without a table of contents, navigating these would prove daunting. I would prefer to see even broader sections, within which lies a group of chapters. For example, a section on Consumer Theory that develops the demand curve and discuses budget constraints and indifference curves. Another section on each of Theory of the firm, Industrial Organization, Welfare Economics, Market Failures etc. Some of these topics are broken up and spread amongst other chapters which would make studying them on their own quite difficult. The section on Oligopoly covers far too much material; everything from advertising, to price discrimination to game theory. In a first year text, these topics could be very briefly discussed. A second year text would have dedicated chapters to each of them. For the most part, topics are present in a logical fashion. However, there are some exceptions. For example, a discussion of the application of Demand and Supply should follow the discussion on Elasticity. This would allow a more complete application of the demand and supply model. Generally, yes. However, if the Equation and Figure references are to be highlighted in blue, I would expect that they are links directly to the relevant Equation or Figure. In my PDF, I found myself clicking on them without any response. If they are not hyperlinks, they should not be highlighted. The blue highlighting of problems looks messy. I'm not sure the purpose of this, but would recommend eliminating it. Some of the tables are quite unattractive. For example, Table 5.2 begins on page 272 and covers 4 pages. The text within it's cells make the table much longer than it needs to be and makes following its content quite difficult. It seems as though there are many missing spaces and comma splices. Otherwise, the text appears to be clear of spelling errors. The text is primarily US focused in all of its examples and policy discussion. If international comparisons are ever made, they are the US compared against another country. I did not see any mention of Canada, Canadian examples, or Canadian contexts. This text has some strengths. However, overall, I would not recommend it. It is far too long, it is missing discussion on topics of importance and has far too much discussion on issues of little value. It is laborious to read as it seems to go on and on and on about certain topics that are not deserving of such discussion neither in terms of importance to content nor in terms of difficulty of the topic. A well written and thorough principles of microeconomics text that covers all relevant material with appropriate focus on specific topics could be half of this textbook's length. This text shows no sign of having any Canadian content. The theory portion of the text is somewhat universal. However, the examples, applications and policy discussions are sometimes not relevant to Canadians or may not be relateable by Canadian students.